The Adelaide Casino is a stand alone casino and restaurant complex which is located just outside Adelaide city centre, an easy to find location and once you’re there you will find a plethora of casino games a long with many restaurants, and the venue is also home to a function area used for weddings, commercial activities and the like. Adelaide Casino Games – The Adelaide Casino have a massive array of table games, boasting over 90 of them you are guaranteed to find the game you are looking for, with table stakes that should suit not only the way you like to play but also a game which your bankroll can sustain! Adelaide Casino Slots – The gaming machines at Adelaide Casino are impressive, not only do they have many linked progressive jackpot machines, but they also have all the latest bonus video slots along with the more classical type of machines which offer a more basic game playing structure. Low, mid and high stake slots can be found on the gaming floor. When you visit the Adelaide Casino for the first time, you may hear the locals refer to the slot and gaming machines as pokies, this is their nick name for these type of machines. So if you do visit this venue then make sure you play some of these pokie machines! Adelaide. Should you wish to contact them by telephone then their number is (08)8212 2811. Adelaide Casino House Rules – The casino house rules state that all visitors are dressed appropriately in smart, casual clothing. No person under the age of 18 will be permitted to enter the Casino at any time. You may be required to provide a form of identification at the casinos request. 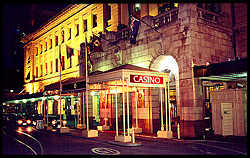 Adelaide Casino Opening Times – The Adelaide Casino is open each and every day, 24 hours a day. The only exceptions to these opening times are on Christmas Day, Good Friday and Anzac Day, when opening times may vary, contact the casino directly for details. The Adelaide Casino Hotel does not boast its own hotel, however there are a range of dining venues available and we have highlighted some of these for you below. North Restaurant – This is the signature restaurant of Adelaide Casino and as such it boasts a wide and varied menu and has a well stocked wine cellar, an ideal venue for you to enjoy fine dining at its very best. Pier One Restaurant – You will find a large a la carte menu service and Asian food all freshly prepared using only the finest ingredients. If you are a fan of wok or grill cooked Asian meals then this is the place for you. Casino Buffet – The place to visit when you wish to grab a quick snack which is instantly available is the Casino Buffet which is the newest dining venue to open at the Adelaide Casino.